Jason Rogers moved to the Capital Region in 2005 and plays the chromatic harmonica. He has performed most recently at Jordan Hall in Boston, on WGBH Boston with pianist Ran Blake’s group, and has appeared around the Capital Region as a special guest of the Lee Shaw Trio. 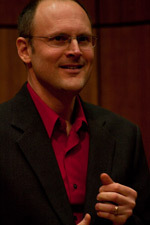 He is the co-author of “Primacy of the Ear”, by Ran Blake with Jason Rogers. Jason graduated with a MM from the New England Conservatory of Music in 1994 with a focus in trombone and is listed in Who’s Who Among Students in American Colleges and Universities. He toured Europe with his own quartet in 1993, and played at the Montpellier Jazz Festival and on French National Radio. In 1994 he traveled to Japan with Hiro Honshuku’s A-no-ne Big Band, which featured George Garzone, Tiger Okoshi and special guests Dave Liebman, Dave Weckl and Mike Stern. He also plays New Orleans jazz, and has played with Mudsole, Jimmy Mazzy, Billy Novick, Doreen and Laurence Ketchens, Made In The Shade and Mickey Bones. Jason studied microtonal music with Joe Maneri (72 notes to the octave) and, with trombonist Jonathan Dimond, performed the world premier of “Duet for Trombones,” a microtonal composition by Julia Werntz, at the Brandeis New Music Series. Jason worked for Gunther Schuller’s record label, GM Recordings. He taught improvisation, trombone, ear training and ensembles at the New England Conservatory of Music and at Northeastern University, directed the Bancroft High School Jazz Ensemble in Worcester, MA, and taught piano and accordion in Andover, MA. Jason currently teaches harmonica and improvisation for all instruments and continues to enjoy discovering all the great music the area has to offer.